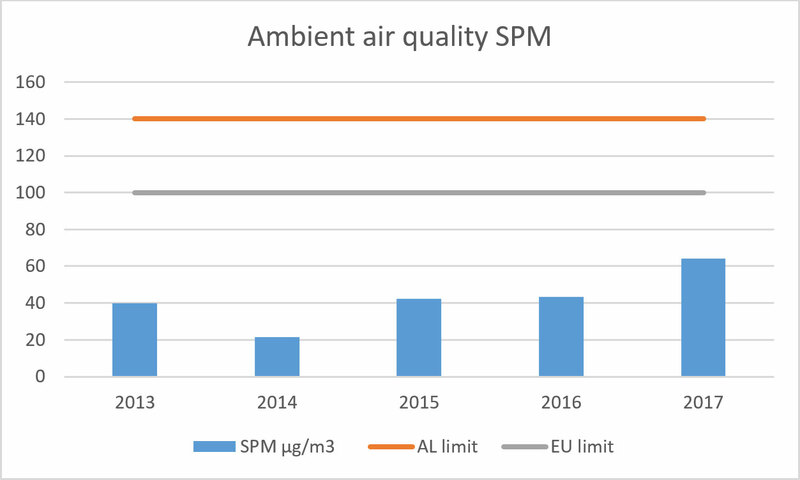 Beyond legislative requirements, the company voluntarily decided to establish and operate a Continuous Emission Monitoring System (CEMS), since the beginning of the plant operation. CEMS is periodically verified for data quality assurance, by third parties. All instruments for CEMS are calibrated and controlled under the EN 14181 standard. 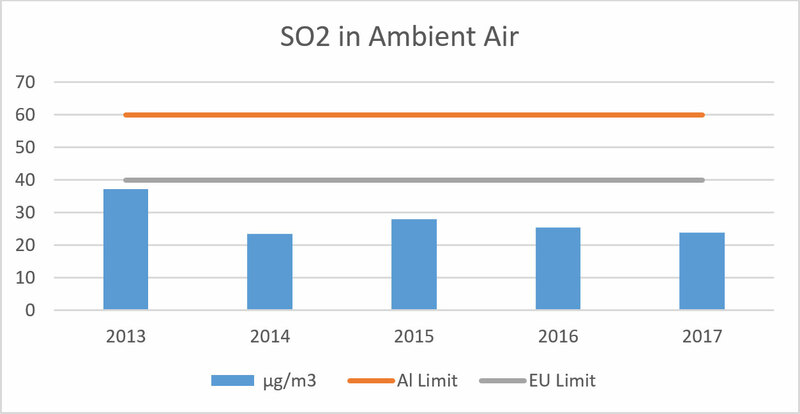 Additional investments to CEMS are made by installing Acquisition and Evaluation of Emissions Data (MEAC 2000) system which generates every day automatically and independently from the operators the emissions values and assures quality and independence. ANTEA operates according to Best Available Technique (BAT), in accordance with industrial Emissions Directive 2010/75/EU, although this is not an Albanian legislation requirement. The plant possesses closed storages for over 100,000 tons of raw materials, and all transportation of materials within the plant is conducted via covered conveyors to decrease fugitive dust. Hybrid filters installed at all point source emissions are regularly maintained. The latest technology of vertical grinding mills is used since they have better environmental performance and improved efficiency in electrical consumption. 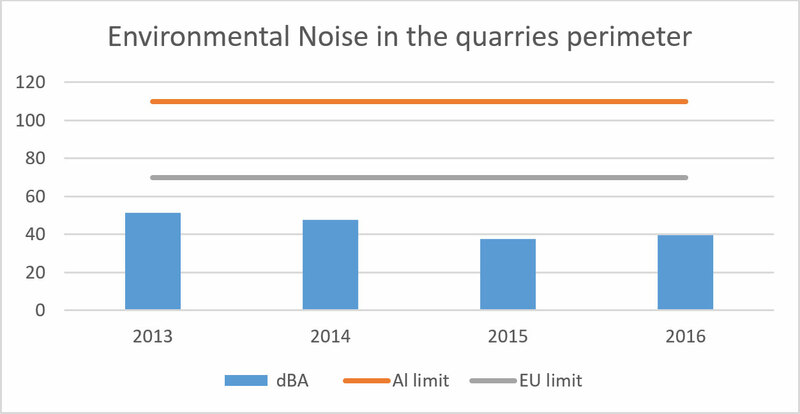 Sound proof equipment’s and buildings insulations are implemented for noise pollution and such emissions are monitored on a quarterly basis. 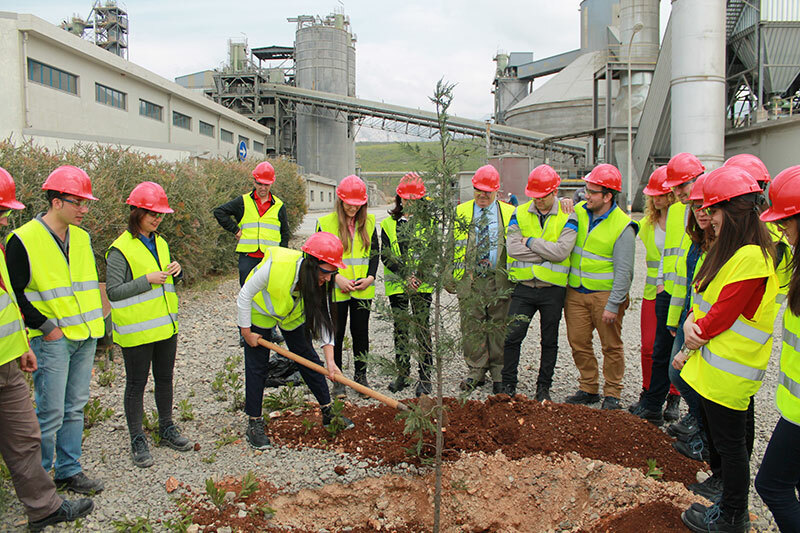 As an example of the company commitment to decrease the emissions compared to Albanian standards, ANTEA Cement has installed Selective non-catalytic reduction (SNCR) in the plant. The facility allows the company decrease NOx emissions. 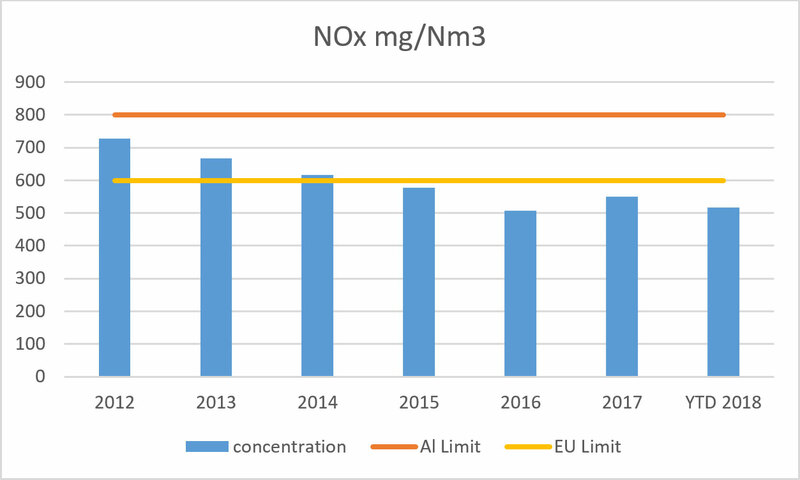 Although NOx emissions are within the Albanian limits, the company invested 600,000 EUR in equipment to further decrease NOx emissions in order to comply with EU standards. The annual operational cost is estimated to be 300,000 – 500,000 EUR per year. 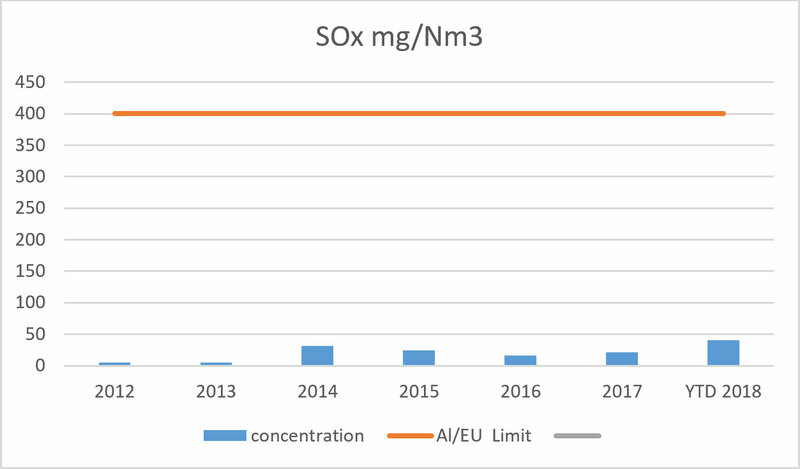 Both Sox and NOx emissions are well below the limits defined in the Albanian legislation. SOx emissions are very low, due to their low concentration in fuels and raw materials. 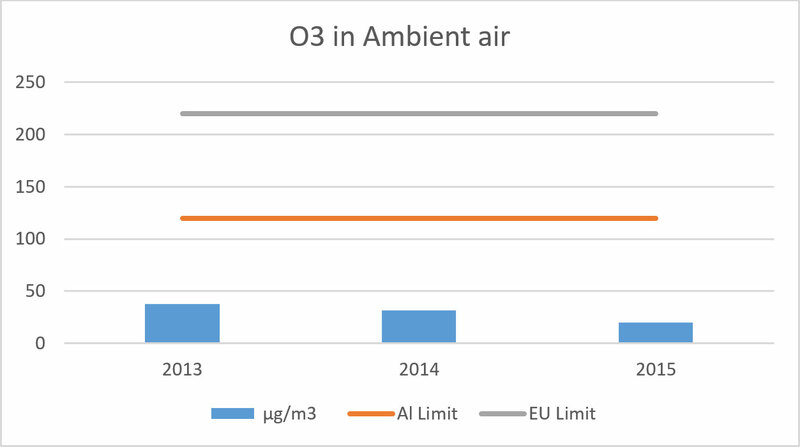 Based on the Continuous Emission Monitoring System installed and operating since December 2010, are presented below the annual average concentration emitted from the kiln stack. 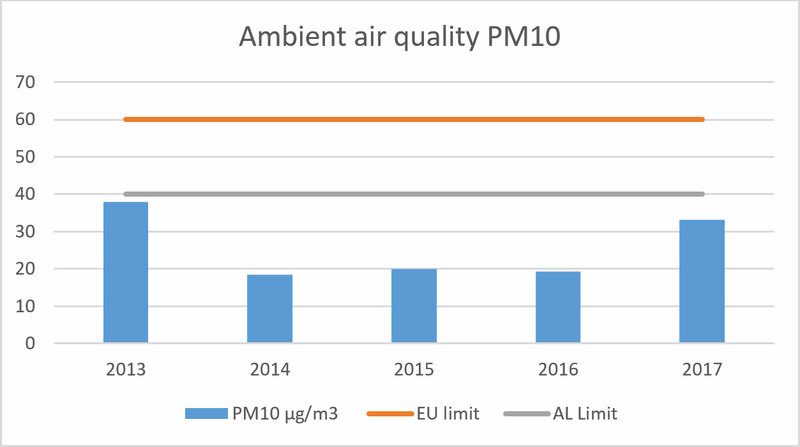 Emission levels in ANTEA Cement Plant refer to standard conditions: dry gas at a temperature of 273 K, and a pressure of 1 013 K.
Bag filters used and properly maintained in order to assure low levels of dust. 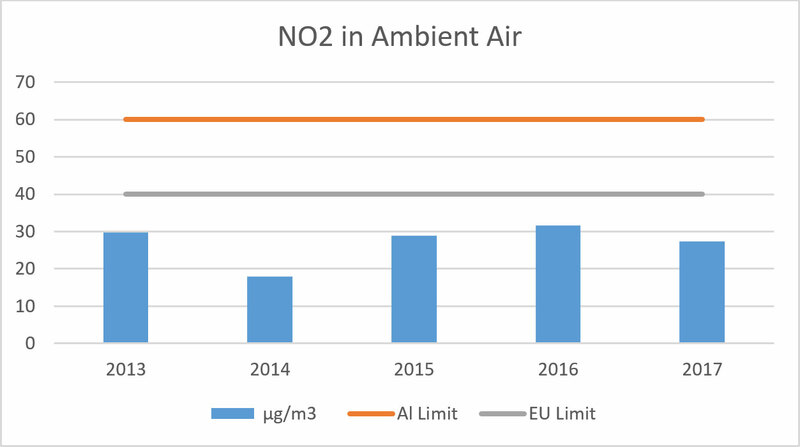 Statistics show that the levels are stable and they do not show any tendency in exceeding the limit neither of emission increases. 2. Fugitive dust is the total of emitted particulates from not defined and non-continuously sources but is connected to certain conditions and activities (like wind, loading unloading, cleaning activities and maintenance). 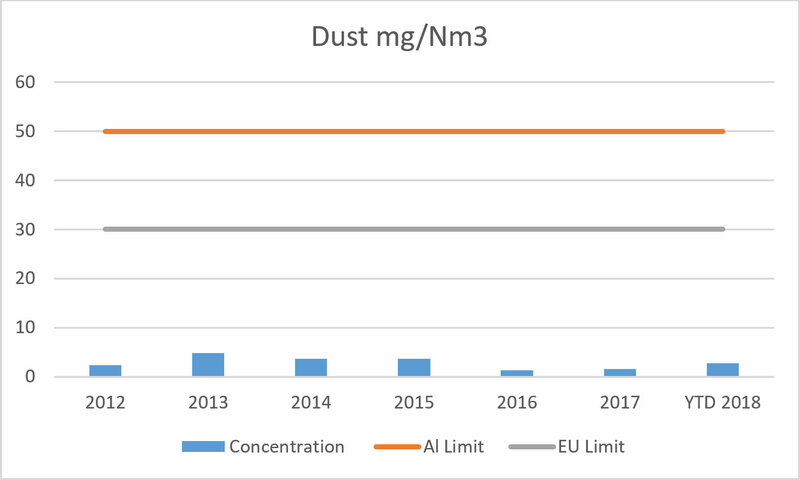 Regarding fugitive dust ANTEA has very good performance (measurements show that the air quality related to particulates concentration is within applied legislation limits). ANTEA monitors the quality of liquid effluents on a monthly basis, through accredited laboratories, and on weekly basis through internal quality checks. Surface water before being discharged is treated through decantation ponds to reduce suspended solids and oil and grease. The surface water collected in the decantation ponds is reused for dust suppression activities, reducing water consumption. The discharged plant surface water quantity is not measured. Waste water treatment facility is implemented and operates since the construction of the facility. The water discharged is measured via flow meters. There are no breaches in the thresholds/limits defined in the legislation. There are no significant impacts identified/reported from the discharge of waste water. ANTEA Cement is committed to be a best practice as an environmentally sustainable business by respecting not only Albanian legislation but the European Union legislation as well. The below listed initiatives and projects make ANTEA Cement a responsible company taking care of environment and community. On July 2012 ANTEA Cement received ISO 14001:2004 certification. The system includes air emissions, quarries, landscapes, groundwater, wells and water waste, liquid and solid waste, natural resources & energy consumption, noise, etc. The system is audited and maintained annually for its compliance. The Plant establishes and maintains procedures to identify and handle the environmental aspects of its activities within the defined scope of the Environmental Management System. For this, ANTEA has established an Environmental Management Policy and Environmental Procedures (EP). 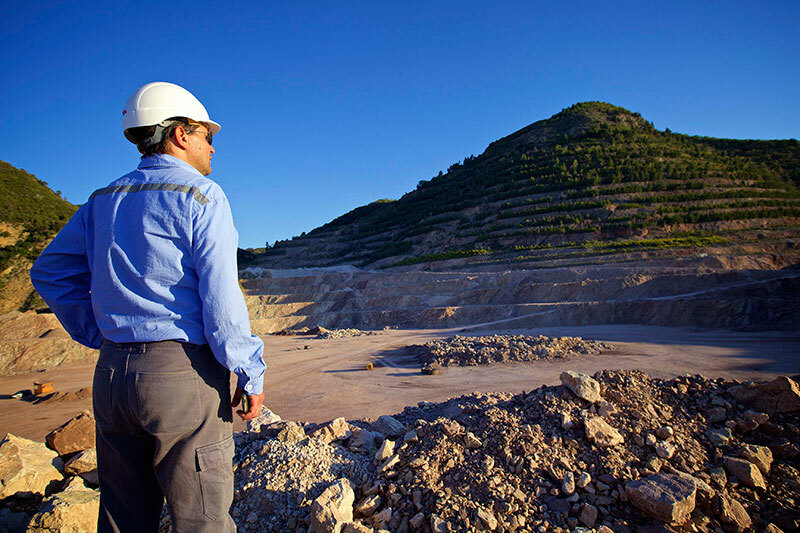 The policy and the procedures cover the cement Plant and the Quarries of ANTEA Cement. Two flora species included in the Abanian Red List, namely Quercus ilex (holly or holm oak) and Salvia officinalis (sage) have been incorporated in the quarry rehabilitation process. Up to date a total surface area of 39,234 m2 has been rehabilitated, with 4,925 trees and more than 2,500 low plants and shrubs. In 2014, 8,300 m2 surfaces area of limestone and flysch quarries have been rehabilitated. Details about limestone and flysch quarries rehabilitation are presented here. ANTEA “hydro-drilling” project has been initiated by Production Technology (PT) in March 2007 following a preliminary Study by ANTEA Geo-Team in cooperation with experts from Tirana University regarding the hydro geological conditions of Burizane Region. After a detailed study that lasted 9 months, the experts concluded that: “Based on the calculated Cement Plant needs (at maximum), the annual rate of pumping from the Borizan aquifer is hardly 3% of the total annual potential of the replenishment of the aquifer, i.e. the “fresh” water supply/recharge in the aquifer for the general area”. Monthly measurements of water levels in water drills to ensure sustainable water withdrawal. Implementation of closed water recycling system. Implementation of a well-defined network of flow-meters in order to identify and easily track possible water leakages. Monitoring water consumption by destination. There are no water sources significantly affected by the water withdrawal. 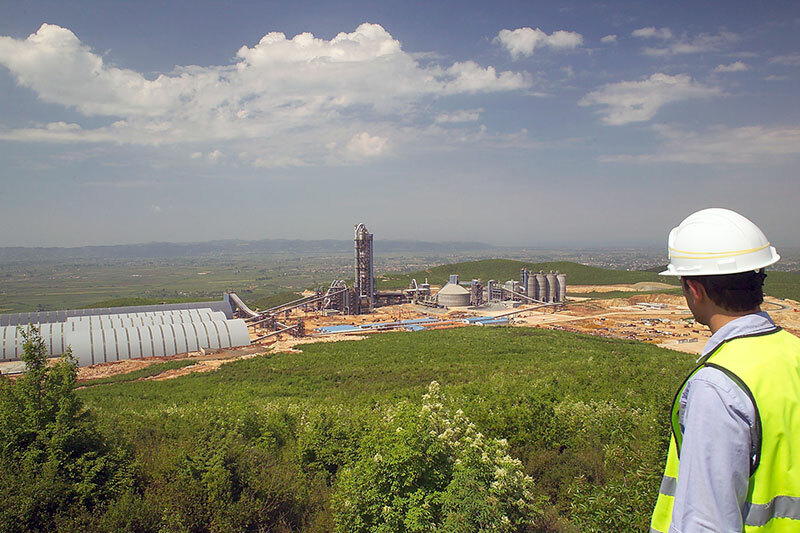 ANTEA Cement recycles more than 60 % of the water used.